A Monitoring Service performs network discovery, monitors network resources in real time, collects monitoring data, sends notifications, executes alerts, and writes logs. A Monitoring Client (Windows GUI) is used to browse and change the monitoring system configuration and to view reports, graphs, and logs. A Web Interface allows you to view reports and graphs showing the current system state or monitoring results for any time period from any Internet browser-enabled device. The monitoring service runs as a Windows service. This component carries out network discovery, monitors network resources in real time, collects monitoring data, sends notifications and regular reports, executes alerts, and writes logs. The service controls the Web server that provides access to the program Web interface. The monitoring client (Windows GUI) is used to browse and change the monitoring system configuration and to view reports, graphs, and logs. The monitoring client is installed on the same host where the monitoring service is running. Connect to localhost using the Remote Desktop Client from your computer. To save system resources and to allow the monitoring service to produce more accurate results it is recommended to close the client GUI when you don’t need it. You can choose Exit from the program menu or from the context menu in the system tray to close the client, or just press Alt-X. The client GUI also consumes fewer resources when it runs in the system tray. See the section Windows Interface for a detailed client GUI description. The Web interface allows you to view reports and graphs that show the current system state or monitoring results for any time interval from any Internet browser-enabled device. Various report types, methods of resource grouping, and reporting time intervals are supported. The Web interface also provides a system summary on the Dashboard tab, shows recent problems on the Alerts tab and provides Help pages online. Recommended Internet browsers are Firefox, Internet Explorer 8+, Google Chrome and Opera. Mobile versions of these browsers can be used to view the mobile version of the IPHost Network Monitor Web interface. The Web interface is provided by the Apache 2.4.29. Web server that is started and controlled by the monitoring service; when the monitoring service is turned off, the Web interface becomes unavailable. See the section Web Interface Overview for a detailed description. All components of IPHost Network Monitor use the Firebird 3 relational database to store the monitoring configuration and data. The Firebird server is installed as part of the product; it runs in application mode (not as a service) and does not interfere with other copies of Firebird that can be installed on your system. The Firebird server is started and stopped automatically. It is possible to run custom SQL queries on the monitoring information; if you would like to run custom queries, please contact support@iphostmonitor.com to obtain a database schema. The monitoring service can perform automatic database backups. You can also make a database backup manually. You can define a directory where to store backups, periodicity and starting time for automatic backups, number of backups to store. Also, you can restore monitoring database manually from a backup file. These options are available at the DB Maintenance page of the Settings dialog in the monitoring client. In case of an unlikely database failure, the service restores the database from the latest backup file automatically when it starts. The client will also detect database failures and will ask if the database should be recovered from backup. In this case you will be able to choose a backup file to restore database from. Database recovery is a lengthy process; it can take a few minutes or a few hours if the database file is huge. Once the recovery process is started, please allow it to finish and don’t interrupt it. The system uses three TCP ports. By default, the Firebird server runs on TCP port 3055; the monitoring client and monitoring service exchange information over TCP port 3056, and the Web interface is served on port 8084, and, optionally, on port 443 over HTTPS. Initial port numbers are selected automatically by the installer. You can change the Web interface ports on the Web Interface page of the Settings dialog in the monitoring client. The service and database ports are listed on the System page and can be modified as described there. The text configuration file, nms.ini is stored in the Application Data folder (“C:\ProgramData\IPHost Network Monitor\” if you have Windows Vista or above, and “C:\Documents and Settings\All Users\Application Data\IPHost Network Monitor\” if you have Windows 2003). The configuration file defines the main system settings such as host names, ports, application paths, and so on. You can change this file directly as explained on the System page of the Settings dialog. Note: you have to stop the monitoring service and exit the IPHost Network Monitor client application before editing the ini file. 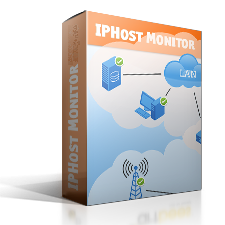 It is not required to install a software agent on a host monitored by IPHost Network Monitor.